Try our Roast with the Most Facebook winner’s recipe for an aromatic and flavourful duck, fresh from the barbecue. Wash and dry the duck. Make sure you remove the neck and any giblets from inside. Prick the duck all over with a fork but be careful not to penetrate the flesh. These puncture marks will allow the fat to render out. Rub the duck all over with rapeseed or olive oil. This will help the rub stick to the meat. Add all the rub ingredients into a bowl and mix together well. Apply generously to cover the skin of the duck. Carefully impale the duck onto the Weber Rotisserie spit, making sure that the spike is inserted firmly into the meat. Attach the second spike firmly before screwing tightly into position. Use a length of string to tie up the duck legs. Set up your barbecue for a medium indirect heat of around 170°C - 200°C. Place a Weber Drip Pan under the meat to capture the juices. Place your rotisserie on the barbecue. Remember, you will need a power supply to operate the rotisserie. Cook the duck with the lid down for around 40 minutes. Then baste the duck with hoisin sauce every 5 minutes for 15 minutes. The duck is ready when it has reached an internal temperature of 74°C. 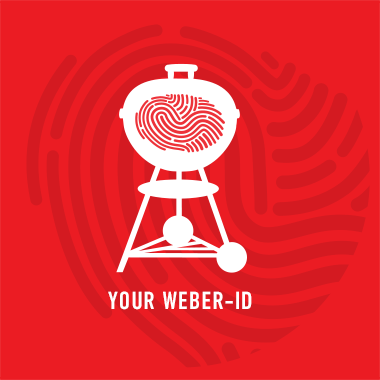 This can be ascertained using a Weber Original Wireless Digital Thermometer. Remove the duck from the barbecue and allow the meat to rest for 10 minutes. Shred up the duck and serve with sliced cucumber, spring onion, steamed Chinese pancakes and more hoisin sauce.